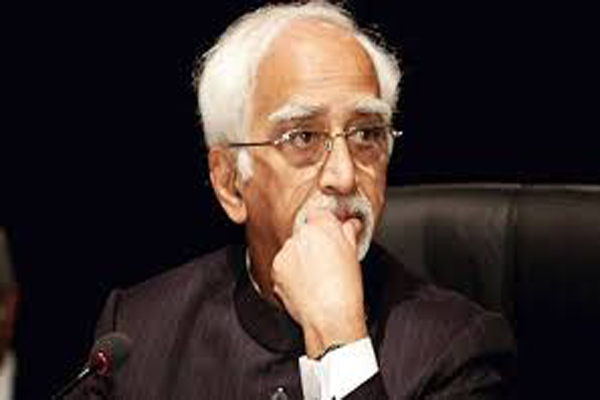 New Delhi(PTI): Some “inventors” are trying to “rewrite” history, but they are not going to succeed as history cannot be changed, former vice-president Hamid Ansari said today. He was speaking at the launch of a book on the country’s first prime minister Jawaharlal Nehru. The book, edited by senior Congress leader A Gopanna, was lanched by former president Pranab Mukherjee and former prime minister Manmohan Singh. Ansari said a long time back, a book titled ‘Time machine’ was written and the idea was that there would be a form of technology by which one could go back to visit what might have happened in the past. “Well, it was a great success. But today, I notice another set of inventors not writers. Inventors trying to create a time machine by which you can go back in history and rewrite history. Now, such an effort is not going to succeed,” he said. “History is history. It has to be read. You can draw lessons from it, you can draw encouragement from it or you can just read it as a college student preparing for term examination. History cannot be changed,” the former vice president said. His comments assume significance as the NDA-led Centre is often accused of “rewriting history” by the opposition. Talking about the book on Nehru, Ansari said it was a “valuable contribution to our legacy, freedom struggle and the great leader who guided it, and the different phases of modern India that we have been through”. Pranab Mukherjee said comments and observation on Nehru could never come to an end. “History of modern India is closely associated and rather integrated with a few personalities. Jawaharlal Nehru is one of them. It is not because he was the first prime minister or because till today, he is the longest serving prime minister of 17 years from August 15, 1947 to May 27, 1964, ” he said. “54 years ago on this day, we lost him. It is because he is truly the architect, not euphemism, of modern, democratic set up in India,” the former president said. He added that Nehru built up all the necessary institutions to support the democratic structure.